Hi All, happy Saturday to all of blogland! And here is my DT entry. I've been playing with inking techniques again. Not sure I like this style as much as my usual style so back to normal next week I think! The background to this card started off white, then it was scrunched up, inked with Dusty Concord Distress Ink then misted with Tattered Angels glimmer mist. It has come out really well and looks gorgeous is real life. To add some shimmer to the image I mixed up some Perfect Pearls powder with some water then painted it with a paintbrush! The background to the sentiment strip was inked lightly in Dusty Concord ink then the flourish background was inked up with Distress Embossing Ink then perfect Pearls powder was sprinkled on top (which then stuck to the sticky ink), left to dry for a few minutes then brushed off with a stiff dry paintbrush to reveal a gorgeous shimmery pattern beneath - also very effective in real life. 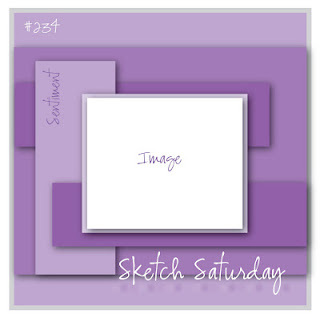 This week's Sketch Saturday challenge is sponsored by Bunny Zoe's Crafts and there's a prize on offer so make sure you're in it to win it!